Substance Abuse 5 Edition Note: This is the bound book only and does not include access to MyCounselingLab®. To order MyCounselingLab® packaged with the bound book, use ISBN 0134297350. An overview of substance abuse for generalist students, prospective mental health professionals, and allied professionals. 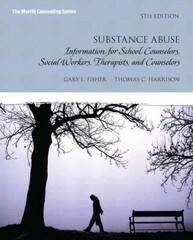 Providing a comprehensive overview of the substance abuse field, Substance Abuse: Information for School Counselors, Social Workers, Therapists and Counselors, 5/e combines the accessible writing style and succinct, practical topical coverage that have made it a market-leading resource for generalist students, prospective mental health professionals, and allied professionals. Continuing to cover basic pharmacology, models of addiction, assessment and diagnosis, cultural issues, intervention, treatment, recovery, support groups, children and families, other addictions, prevention, and confidentiality in its applied and concise style, this latest edition of Substance Abuse contains expanded coverage of screening and brief interventions, recovery oriented systems of care, spirituality and other current topics as well as a new chapter dedicated to motivational interviewing. Also available with MyCounselingLab® This title is also available with MyCounselingLab—an online homework, tutorial, and assessment program designed to work with the text to engage students and improve results. Within its structured environment, students see key concepts demonstrated through video clips, practice what they learn, test their understanding, and receive feedback to guide their learning and ensure they master key learning outcomes.